When Kitchen & Bath Details was asked to work on a kitchen remodeling project for this Cohasset client we loved the directive – take a small kitchen in a historic home, open it up a bit, provide some seating, an amazing fireplace and keep it cozy! Our designers began Plain & Fancy Custom Cabinetry in white with a low sheen enamel with absolute black honed granite countertops and installed Sub-Zero & Wolf Appliances. A hutch with open glass doors and lighting showcases beautiful china and adds a warm glow to the room. A desk provides an office workspace, while cozy dinners are prepared the flat screen TV allows the “chef” to catch up on the news. Please contact Jill Muldoon to schedule an appointment with one of our designers or visit our showroom to see more of our work. This project in Cambridge, MA called for a great deal of historic preservation and replication, as our client wanted to keep with the period of the home. We worked with our custom cabinet line, Plain & Fancy, to create a cabinet door style which mimicked the original wainscoting in the foyer of this striking historic home. A hand glazed latte finish was selected for the cabinetry and panels which mask the Sub-Zero and Wolf appliances. Both granite and wood were used for the countertops and glass front cabinets were installed at the end of the island to preserve an “academic and historical” feel for the homeowners collection of cookbooks. We had the great fortune to remodel the Butler’s Pantry (photo below center) at the same time as the kitchen was remodeled. Glass front cabinets were used in order to open up the small space, at the same time showcasing an impressive collection of barware. The rich dark wood is consistent with the look and feel of the home’s history and setting. 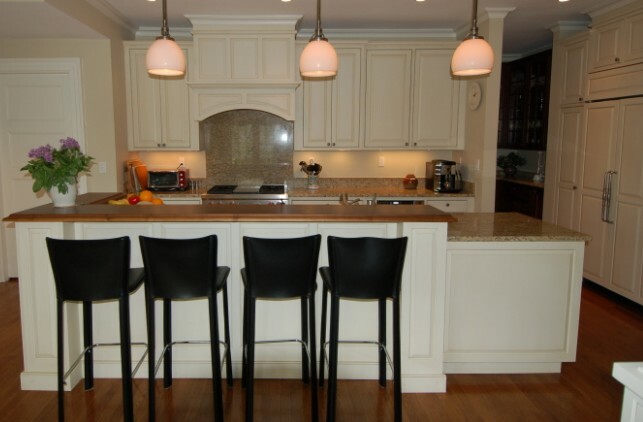 At Kitchen & Bath Details we love working with Plain & Fancy Custom Cabinetry. Whether our clients on the southeast coast of MA are working on a new custom built kitchen or are working on a kitchen remodeling project Plain & Fancy has cabinetry to fit all styles. 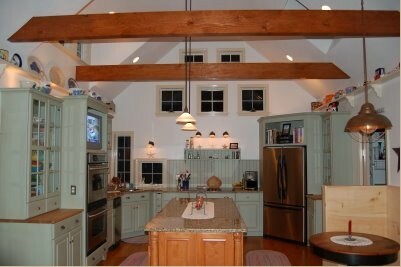 We all live in our kitchens, truely the epicenter of the action in most homes. With Plain & Fancy Custom Cabinetry the plentiful accessories, wine coolers, built in hidden pantry's, the working desk, nooks to house your baking tools or library of cookbooks, add the element of fun and personality to your kitchen. The design team at Kitchen & Bath Details understand that you need to cook, work and function in your kitchen, but also live, laugh and share in that same space! Contact Jill Muldoon to schedule an appointment with one of our designers. Few of us are lucky enough to have incredible architectural features in our kitchens. This home's kitchen has impressive cathedral ceilings which are intersected by wooden beams - our inspiration for this antiqued distressed kitchen. Kitchen & Bath Details chief designer Tena Collyer used a small crown molding feature to transition the space between cabinetry and cathedral ceiling. To anchor the kitchen Tena used Plain & Fancy Custom Cabinetry in a beautiful celery finish around the perimeter of the kitchen. Taller cabinets were installed with glass doors for the purpose of showcasing the homeowners collections of vibrant pottery. The center island, with its heirloom stain atop maple and decorative legs appears as a beloved piece of antique furniture. A master of space planning,Tena made excellent use of the rooms corners, angling the refrigerator and sink on opposing sides of the cook top. Traditional beadboard is used in an unexpected way, as the backsplash and shelving for spices. The client, a florist, asked Kitchen & Bath Details designer, Kathy Hurlburt to create a modern cottage kitchen for her lovely home. The foundation for the cottage feel began with Plain & Fancy cabinetry in a distressed white antique with inlayed bead board styling. The upper wall cabinets have glass inserts which give the illusion of open space and allow the homeowner to infuse a pop of color with pieces from her pottery collection. Aiming for classic and fashionable, Kathy selected subway tile to compliment the granite countertops. A white, apron front farmers sink takes center stage, flanked by open shelving for the homeowner to display her plants and flowers. 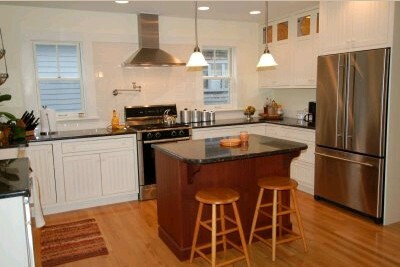 The modern twist comes in the form of stainless steel appliances and utilizing a rich walnut for the island.